I hear Quinn laughing, “No one really knows what they are doing!” That’s cold comfort when being rolled into surgery or sitting with my mouth wide open in the dentist’s chair. I have to admit, his laughter was infectious and I usually find myself laughing when I realize too late (again) the upside AND downside of the seed he planted so long ago in my philosophy. When Kerri spontaneously smacked out this design, it was a case of process/design alignment. She simply trusted where she was going. “Hmmm,” she said, and moved on. In improvisational theatre, it’s called ‘yes, and.’ Say yes to what you are given. Deal with what is there, not what you’ve decided should be there. Spontaneity, the freedom of movement and expression, is born of the kind of trust that ‘yes, and’ engenders. In trust, just as in ‘yes, and,’ there is no resistance. Artistry is pure relationship and requires giving up the illusions of control. The word trust always brings me to the caterpillar (metaphors permeate my noggin). In cocooning, going to mush to be reborn as something utterly brilliant and unrecognizable, there is inevitability. In emerging from the cocoon, discovering wings, stepping to the edge of the branch, and leaping for the first time, there is trust. The Chinese have a term for this meditation: wu wei. Do nothing. In creative communities it’s known as flow. Athletes train, actors rehearse, but when opening night comes or race day dawns, the advice is always the same. Let go. Trust the work. In other words, cease pushing and get out of your own way. Working from tension, pushing too hard for outcomes, causes injury. It jams flow. The final pose at the end of a yoga practice is called savasana, or corpse pose. It is to surrender, not in the sense of giving up but more of giving over. It is a release of tension. 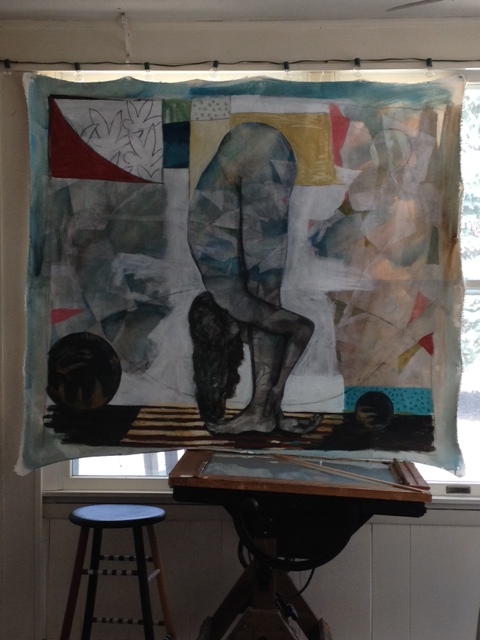 My Earth Interrupted paintings have become for me a kind of savasana, a letting go. As Jim used to teach me, you’ll know you are in “that” place of flow when it feels like a dance of giving and receiving and you have no need to distinguish which side of the dance you are on. Both/and. Give/receive. Faith is one of THOSE words. So, as is my practice when wading into one of THOSE words, I look it up before writing about it. And, as is always true when writing about one of THOSE words, I find beautiful ambiguity within the proffered definitions. 1) complete trust or confidence, 2) strong belief based on spiritual apprehension rather than proof. My life has taught me that truth (another one of THOSE words) can only be found within the paradoxes. If you can reduce something to a singularity, a black or white concept, something graspable, then it may be a rule or law but is never a container of truth. THOSE words point to deep experiences, the mysteries that cannot be fully grasped or squeezed into a container. Love is one of THOSE words, too. We designate the first week of spring by a heavenly marker known as the equinox. Equal night. We look to the sky to understand the happenings on this earth. I’m happy to report that my first sighting of tiny green shoots breaking through the crusty earth in my backyard happened this week. The first sign of spring. The resurgence of green life after months of root-resting hibernation. I couldn’t help myself. For kicks I also looked up the definition of the word apprehension. It smacked to me of being yet another one of THOSE words. Yep. 1) anxiety or fear, 2) understanding, grasp. Anxiety. Understanding. Standing before a blank canvas I often feel as Chicken Marsala. I tie on the blindfold and step. Sometimes I step boldly with complete trust. Sometimes I step timidly with great apprehension. It is a full spectrum of faith. And, because I can never know (another one of THOSE words) the best I can do is practice. Finishing a painting is really about having a conversation with yourself. This one is talking! Respect the boundaries of others; do not seek to control anyone else. You can only control your own choices. Learn and honor with absolute integrity your own boundaries so that others may not try to control you or your work. Unfortunately, this is usually only learned through a certain amount of trial and error. Learning to trust is an art, and absolutely necessary. Learn to trust yourself first. Learn to trust others. Always respect the tradition of your work, its ancient human conversation. Connect to tradition, to all your teachers and your teachers’ teachers. Give yourself to it so that it can give to you and to your work. Honor it with rigor and doubt, with hours and hours of study and practice. Then let your teachers go, follow the path that you understand as truth. You will know it when you see it. It will be your part of the ancient conversation. Likely, you will find that parts of one or two of your teachers have become part of you. If you do not let your teachers go, your part of the ancient conversation will not be yours, but rather what you think other people want you to add to the conversation. That is not from you and only clogs up the conversation. Horatio asks great questions: What is the tradition that you carry forward? I follow the line of Tom and Marcia McKenzie, who learned from DeMarcus Brown, who learned from Eva Le Gallienne, who learned from…. What teachers/teaching do you need to let go? Seeing an opportunity to feign disbelieve and betrayal, I cried, “What! I always tell the truth!” My brow was knit, my eyes wide in manufactured incredulity (not easy to do. Try it but if you sprain your face I will deny that I suggested it. You are on your own). Thinking I would win at least one voice of sympathy (Jill…) I was truly taken aback when both sides, virtual and actual, said, “Liar!” Not knowing when to stop I put my head on the keyboard and sighed, “I can’t believe this. I’ve never lied in my life.” With the explosion of loving mocking laughter and riotous derision I knew I was bested – and was grateful for it. “Well. Occasionally I might exaggerate,” I admitted. “Occasionally!” they crowed. “Always!” They see me and love me for what they see. Sometimes when working with groups I guide an exercise called See And Be Seen. It is a powerful moment when a group recognizes that Seeing is easy, directional, outward; To Be Seen is another story. To Be Seen, one must stand still, open and allow. It requires vulnerability and trust. It is where presence becomes possible. In our too fast world it needs to be a conscious act. We choose to be seen or not. We rarely see what is right in front of us; we rarely let others in to see what is most important in us. Look beyond the role and you’ll find treasure every time. I am fortunate to have in my life so many wise and powerful eyes willing and capable of seeing. These amazing women who are teaching me to stand still and open my heart.